We planned to spend three weeks this past January in Honduras on a research expedition to two locations in the remote eastern portion of the country. Our goals were to work with local conservation pioneers and preserves to survey and promote the wide diversity of bird life in these special yet threatened regions. Note: Ian Gardner was inspired to organize the CACAO 2017 Expedition after participating in our Birding for Conservation trip to Honduras in February, 2016. This initiative is the first research project under the auspices of the newest JVAS Committee: Partners in Neotropical Bird Conservation. Contact Laura Jackson if you would like to get involved in conservation and education projects focusing on migratory birds. Cacao is the Honduran colloquial name for the threatened Red-throated Caracara, a species of raptor that has nearly disappeared from Central America in the past few decades. It is also the acronym for a small but passionate cooperative of multi-national conservationists. We planned to spend three weeks this past January in Honduras on a research expedition to two locations in the remote eastern portion of the country, Reserva Biologica Rus Rus in Gracias a Dios and Parque Nacional Botaderos in Olancho. Our goals were to work with local conservation pioneers and preserves to survey and promote the wide diversity of bird life in these special yet threatened regions. We were able to meet our funding goal for the trip thanks to the support of many individuals and several Audubon Society chapters like JVAS. We knew beforehand that these federal lands, Reserva Biologica Rus Rus and Parque Nacional Botaderos, were protected by title alone. During our expedition we learned why. Both areas are remote, at least a very rough 4 hour drive from the closest ICF facility (Instituto de Conservacion Forestal). But they also host an incredible diversity of flora and fauna, particularly birds. 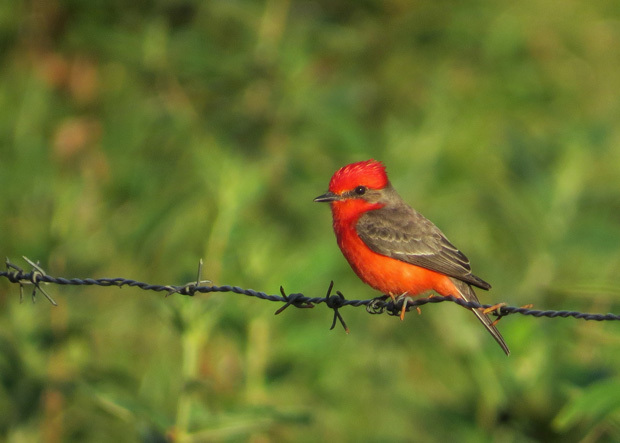 The male Vermilion Flycatcher is brightly colored and often perches in conspicuous places as it scans for insect prey. Habitat destruction is the greatest threat to this colorful species. We recorded over 280 bird species in the dimorphic landscape of Rus Rus. This area is comprised of two distinct ecosystems: expansive pine savanna and dense gallery* forest. Each contains a unique suite of species that is constantly evolving, so researchers are recording more species with each visit. Our expedition recorded range expansions for over 20 species and found such notables as Harpy Eagle, Crane Hawk, Jabiru, Black Rail, Green Ibis, Steely-vented Hummingbird, Scaled Pigeon, Northern Potoo, Yellow Tyrannulet, Aplomado Falcon, and Snowy Cotinga. In Olancho, we surveyed miles of mountain trails in the central highlands and recorded over 200 species. Our top target was the pine forest denizen Red-throated Caracara, which we missed, but we were told of many recent encounters. We did see several other target birds such as Ocellated Quail, Buff-breasted Flycatcher, Olive-sided Flycatcher, Golden-winged Warbler, Golden-cheeked Warbler, and Red Crossbill. We also surveyed the lowland portion of Isidro Zuniga’s Las Orquideas Nature Preserve, where we documented a Wedge-tailed Sabrewing, a hummingbird with an isolated population that can only be found in this small region of Honduras. Protected forests in eastern Honduras also face serious threats from natural resource extraction companies and cattle ranchers. Mining and Hydropower projects destroy hundreds of hectares and divert miles of rivers in Olancho. Cattle ranchers are recent migrants to the Rus Rus region and are illegally grabbing land to clearcut for cattle pastures. However, a determined community of environmentalists is standing up. These activists are literally risking life and limb to protect the forests, as you read in last year’s article about the late Berta Caceres. Fortunately we never faced any threats during this expedition and were able to talk with local communities and learn about these pressing conservation issues from their perspectives. * Gallery forests are forests that form as corridors along rivers or wetlands and project into landscapes that have fewer trees, such as grasslands or deserts.